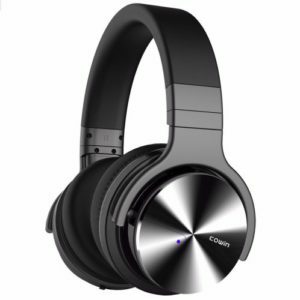 COWIN E7 PRO Active Noise Cancelling Bluetooth Headphones is upgraded version of Cowin E7. Promises better technology for noise canceling and quality of sound. They provide significant noise reduction for travel, work and anywhere in between. They have upgraded soft ear cushions for Comfort with the professional protein ear pad. They provide Much Higher-quality Built-in Microphone and NFC Technology. 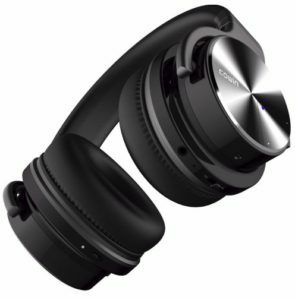 The package contains Cowin E7 PRO Active Noise Cancelling Bluetooth Headphone. The product is also equipped with headphone case. It also contains micro USB cable. It contains 3.5mm audio cable. There is user guide available for you to take any sort of help. Dimensions 6.5 x 3.6 x 7.1 inches. The batteries available are 1 Lithium ion batteries required (Included). The function specifications available are Bluetooth, Microphone, AUX, Active Noise Cancelling. The operating frequency for the product is 20Hz-20 kHz. The Power supply is the Lithium battery. And micro USB cable Audio source: iPhone, iPad, Samsung, Blackberry, Nexus, Smartphone, Computer, PC, Notebook, MP4, MP3 etc. It has professional Active Noise Cancelling Technology. Its Noise Cancellation Level is very suitable according to surroundings. It provides good sound quality, built-in Microphones and 45mm large-aperture gives you powerful and quiet sound. Its upgraded Soft Ear Cushions provides a comfortable around-ear fit so you can wear it all day long without hurting your ears. Advanced Bluetooth 4.0 and NFC: Quick and stable connection with your Bluetooth devices. Its stable battery life makes it a reliable product. Advanced active noise reduction technology quells airplane cabin noise, city traffic or a busy office. The noise cancellation can work well in wire and wireless mode. Its proprietary 45mm large-aperture drivers provide you with the accurate bass response. These Bluetooth headphones contain upgraded Soft Ear Cushions which make it durable and comfortable to use. The headphones have one downside: You have to turn off Bluetooth on your phone first to allow the audio cable to work. COWIN E7 PRO ANC headphones are engineered to produce good sound. These are comfortable and easy to take with you. Put them on, and suddenly everything changes. Your music using these headphones is deep, powerful and balanced, and so smooth that every note sounds clearer. For me, there was too much bass. Which was possible to correct with the equalizer. This was annoying for me, but for people who like strong bass, it is OK. But still, the mids and highs come through clearly. The headphones have skin texture and comfortable around-ear fit so that you can wear all day long. NFC pairing aided by voice prompts promises quick and stable connection with your Bluetooth enabled devices. It provides 30-hour playtime per full charge at Bluetooth mode. A built-in 800mAh battery won’t allow your headphones power off, you can enjoy your world without noise for 30 hours’ long time. 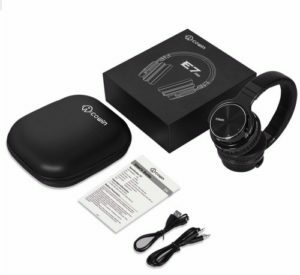 E7 professional Headphones are light-weight with softness on the headscarf and supermolecule ear cushions, whereas the ear cups rotate for a fine-tuned match. It provides advanced active noise reduction technology, for instance, you are in noise, town traffic or a busy workplace. Thus you’ll focus a lot of on what matters-your music, movies, and videos. They scale whisper and pitch of the sound to the optimum value. You’ll discover sound quality that will be refined and pleasant such that you will ne’er have noticed. And this is often its true beauty. It’s secured by COWIN proprietary prime quality 45mm large-aperture drivers. The Cowin E7 Noise Cancelling Headphones have the reasonable ratio between price and features. If you do not expect much from sound quality, or if you like strong bass, these headphones are for you. With noise canceling they are good enough to use it wherever you need. In the case, you do not want to spend lots of money buy them. These headphones have good noise cancellation for travel, busy office and anywhere in between. The built-in microphone is of high quality. The battery life is also stable. You have to take off the headphone every 1-2 hrs to get your ears to relax.